A man who has repeatedly claimed 'I made Jayalalithaa Chief Minister', Natarajan was someone who preferred to remain close to power centres. Natarajan Maruthappa, businessman and husband of J Jayalalithaa's aide Sasikala Natarajan, died at a private hospital in Chennai in the wee hours of Tuesday. Natarajan had been admitted to the Gleneagles Global Hospital in Chennai after his condition deteriorated a few days ago and he had been placed on ventilator. He had been admitted to the hospital with a chest infection. He had been on a transplant waitlist since April 2017 and underwent a combined liver and kidney transplant surgery in October 2017. He had been suffering since. Sasikala, lodged in Bengaluru Central prison after she was found guilty in a disproportionate assets case was allowed to visit her ailing husband on parole. As his condition became critical, friends and family gathered at the hospital on Saturday evening. TTV Dhinakaran, who had recently announced his party and is Sasikala's nephew also reached the hospital on Saturday evening. MDMK leader Vaiko also paid a visit to the hospital. He was quite candid about his ambition to become a power centre himself and at one point of time it was speculated among political circles in TN that Natarajan fancies himself as the CM of Tamil Nadu, and Jayalalithaa as the country's Prime Minister. Born in Vilar village in Thanjavur, Natarajan used to describe himself as a student leader who had worked closely with the DMK. 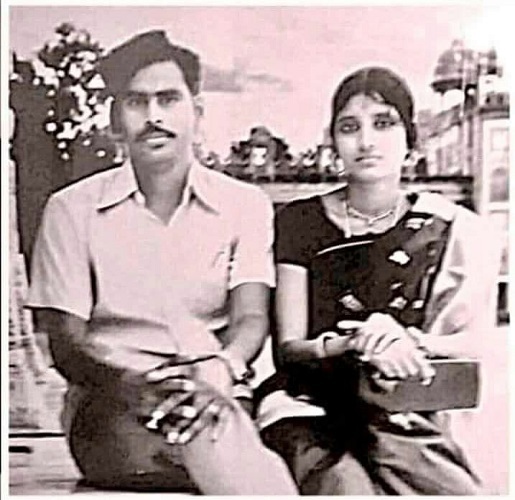 In 1973, M Natarajan, who was an employee in the state’s Directorate of Information and Public Relations married Sasikala. DMK chief and then Chief Minister M Karunanidhi even presiding over their wedding. But the couple went through trying times early in their marriage. In an interview to Shobha Warrier for Rediff, V Chandralekha, who was collector of South Arcot in the early 1980s, said Natarajan lost his job as an Assistant Publicity Officer during the Emergency and remained unemployed for four years between 1976 and 1980. While he was eventually reinstated and posted as Chandralekha’s PRO following a court case, it was presumably during the intervening period that Sasikala started a video rental shop in Chennai. Soon, the video rental business became videography, after Sasikala went to Singapore to purchase video recorders to film marriages and other functions. It was then that Sasikala turned to her husband’s boss, Chandralekha, to help boost her fledgeling business. Chandralekha’s introduction was enough to seal the start of a lifelong friendship. After Sasikala and her team filmed several of Jayalalithaa’s functions, “some good association developed,” said Natarajan to NDTV. The association developed into trust as Natarajan and his wife stood by Jayalalithaa through one of her darkest hours as a politician, following the death, in 1987, of her mentor and then Chief Minister MG Ramachandran. The couple moved in with Jayalalithaa into her 'Veda Nilayam' residence. In 1989, Jayalalithaa came under criticism for being 'heavily manipulated by Natarajan', but she denied it. but Natarajan was thrown out in 1996 for trying to dominate Jayalalithaa. Natarajan, however, told NDTV in an interview in 2014 that it was he who broke contact with Jayalalithaa, and not the other way around. In the interview, Natarajan claimed that in 1991 even the Chief Secretary and Home Secretary were appointed after consultations with him. He said that during her first term as the CM, Jayalalithaa had no option but to listen to him, since she was new to the government. Natarajan prided himself as being a key person in her ascension to power, and in figuring out the nitty-gritties of governance. Even when he was not in Jayalalithaa's good books, bureaucrats and AIADMK leaders used to turn to him during times of trouble. It was widely believed that he still had control over AIADMK's ticket distribution during elections. A Rediff report from 1998 called him a 'Subramanian Swamy clone' and recalled how Natarajan lead a padayatra from Kanyakumari to Chennai that year. The Yatra by his Makkal Vizhippunarchi Iyakkam, or the 'People's Reawakening Movement' was open about his wish to capture Fort St George, the seat of power. Natarajan was reportedly friends with BSP leaders Kanshi Ram and Mayawati, who used to stay with him during their visits to Chennai. Though he tried to resurrect his political career, Natarajan largely remained in the sidelines till Jayalalithaa's death and even after. In 2011, he and activist Pazha Nedumaran built a memorial in Thanjavur for the victims of the Mullivakal battle (the last LTTE bastion). Though his wife Sasikala continued to remain with Jayalalithaa, Natarajan was never welcomed back. In 2012, the couple received a jolt when Sasikala was thrown out of Jayalalithaa's house. This after reports of Sasikala's family planning a coup reportedly reached Jayalalithaa. However, Sasikala managed to come back to Jayalalithaa, but Natarajan still remained outside. After Jayalalithaa's funeral, he gave interviews to Tamil channels saying that there was no vaccum in the party that could not be filled and that with the blessings of MGR and Jayalalithaa, anyone could run the party. But those plans were not successful as Sasikala's attempt to become Chief Minister was thwarted by a rebellion by O Panneerselvam.